This week's photos of Food & People is the second part of a photographic series of different cities by Charlie Grosso. Below is whatÂ Charlie has to say about the photos and her experience of Sihanoukville, Cambodia "Wok the Dog" is an photographic project that examines theÂ commerce of meat, and how expediency and modernity can rob us of a connection to life. 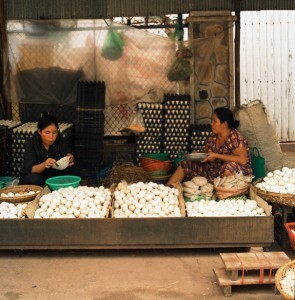 Since 2004, I have photographed markets in 15 countries and 55 cities. In the small costal town of Sihanoukville, Cambodia, the women walk around in what would be considered to be pajamas in the Western World. One would not do well to make easy assumptions in foreign lands so I asked a British Ex-Pat friend of mine who is married to a Cambodian woman if those are indeed pajamas or are they simply printed cotton shirts and pants. He told me that they are indeed pajamas. The contrast in the market of women in colorful pajamas along with all the goods from the Ocean and the deep amber of the dirt is a sight one cannot forget easily.